MyTeam11 is a Fantasy sports platform where you can select your team of 11 players using your knowledge, skills and of course luck to compete with other players to win real cash. But, since you are already playing fantasy cricket on platforms like Dream11, why would you wanna join another one? Answer: Because when you register with a referral code- 97V3LMF3CW, just like Dream11, Myteam11 also gives you Rs.100 sign up bonus. 1. First, download the MyTeam11 app from the website. 2. Open the app and tap the “Register your account” button(or you can login-in with Google or Facebook). 3. Fill the form that appears on the next page and verify your mobile number and enter this Myteam11 refer code: 97V3LMF3CW. 4. Hit the Register button. 5. Now verify your email through the verification link. If you didn’t get the verification link or face any other trouble contact their Live support services. Their support services are one of the quickest in the business. You can find the support chat in the "More" tab. 6. Login with the email address and password you entered on the registration page. 7. After logging in you’ll have Rs.50(Rs.25 for mobile number verification and another Rs.25 for email verification) in balance. 8. To get the remaining Rs.50, go to your Account/Profile(from the menu) and enter the details of your PAN Card with a photo. My PAN Card was verified within 5 hours but it can take up to 3 days for the verification process to complete. 9. After the PAN Card verification, you’ll get Rs.50 and you’ll have Rs.100 in your bonus balance. You can use this cash to join leagues. Note: Now you will only get the referral bonus when you verify your mobile number, email, and PAN card. Enter this Myteam11 referral code to get the sign-up bonus: 97V3LMF3CW. 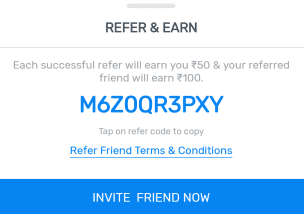 On MyTeam11 you can earn Rs.50 per referral and your friend gets Rs.100. You and your friend will only receive the referral bonus when they verify their phone number, email ID, and PAN card. So, make sure when you invite your friends they verify all their details. In case of unsuccessful verification, they reserve the right to cancel your referral amount. 1. The Refer and earn offer is valid for the MyTeam11 app(iOS and Android) only. 2. Make sure that the reference you provide is a new user and is going to register with us for the first time. 3. While referring your friends you need to make sure that they go through the verification process in which they need to verify Their phone number, Email ID and Pan card because you both will get the referral amount only after the successful verification of these details. 4. Where in the referred person (New user) will get Rs 100 and the referrer will get Rs 50 on each successful verification. For example, If you refer someone then you and that person will not receive the referral amount until that person doesn’t verify his details on our website. It works pretty much like Dream11. Select a match-You’ll be taken to the create-team page. You have 100 Credits. For each player, you select you’ll have to pay the credits assigned to the player. Stay up to date by reading news and match previews. You can create multiple teams, up to 6. After selecting your fantasy team pick your Captain & Vice-Captain. Captain gets 2x points and VC gets 1.5x points. Select a match under 'Fixtures'. The cash bonus available in your account can only be used to join leagues with 50 or more members. So if you are only using your referral bonus you have to join leagues with more than 50 members. My suggestion is, start by joining low entry fee leagues. This way you'll know how MyTeam11 works with less risk. The leagues that have the “M” symbol means that the league won’t be canceled even if it’s not completely filled. But this also means that prizes will be different if all the spots are not filled. And don’t hesitate to create and join with multiple teams. As you never know which players might perform well. To easily create another team, tap the "Clone" button. This will clone your team. After you can make any changes you want. Click here to see the fantasy point system of MyTeam11. MyTeam11 launched safe-play a few months ago. The leagues of matches available in this section can be joined until the match begins. It is a great option for those who don't want to risk picking uncertain players in their teams. But not all matches are available in safe-play. Mostly domestic matches are not in safe play. You can only withdraw your winnings(the cash prizes won in leagues). The cash bonuses(referral code bonus) can only be used to join leagues. The minimum withdrawal limit is Rs.200. Before you can withdraw, you need to send your bank account number, name and IFSC code for verification. It can take up to 3 days. And yes, you can give details of your Paytm Payments Bank or any other digital bank. Payouts are made within 3 working days. 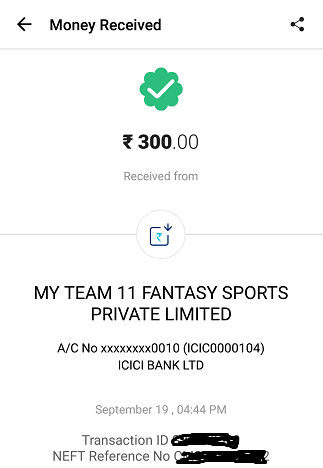 MyTeam11 is a great platform to play fantasy cricket. This is my second favorite after Dream11. You can share your MyTeam11 refer code and get Rs. 50. You can use this cash bonus to join as many leagues as you want, as long as there are 50+ members. I signed up with referral code but did not get the bonus. To get the sign up bonus you need to verify your PAN card. I've explained it above.